I've said it before and I'll say it again (because clearly I'm a broken record), DIY Christmas gifts are one of my favorite things to give. Hopefully, they're also a favorite to receive. 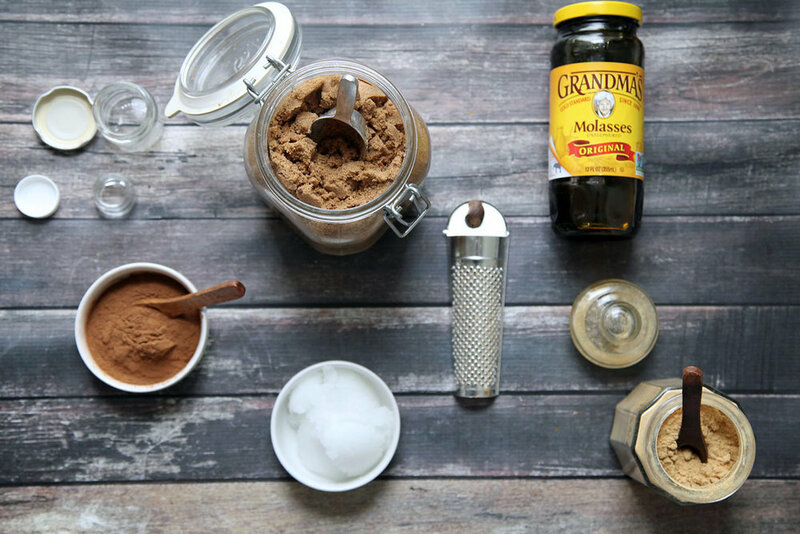 Of course, when it's something as useful (and delicious) as this gingerbread lip scrub, how could it not be? Growing up, making homemade gifts was a routine part of our holiday traditions. My Mom showed us that not only were you gifting someone a present, you were giving them something with meaning, something that you specifically thought about and made with the recipient in mind, something that had a little extra love in. Speaking of gifts with meaning, you'll notice a special cinnamon container in a few of the photos below. It's actually an exquisite box hand-carved from cinnamon bark and filled with Vietnamese cinnamon. The boxes are made in Tra Bong which is located in the Quang Ngaio region of central Vietnam. The fair wages received from this aromatic and beautiful item allow the craftsmen to feed and educate their children as well as improve their living conditions. It's important to consider those less-fortunate year-round, but specifically at this time of year, remember to think about how your gifts can not only have an impact on those who receive them but also those who made them. Giving back is one of the most important things in life to me so I wanted to highlight this wonderful item (that can be bought in World Vision's Gift Cataloghere) not only in the use of the homemade gift below, but also as a wonderful gift on it's own. And as for the lip scrub, this easy and yummy (No, really...it tastes delicious!) gift comes together in a matter of minutes aka if you need a last minute gift for a beauty lover or as a stocking stuffer, consider whipping up a batch of this, putting it in some cute little jars, attaching a label and giving it away! Mix all ingredients together in a small bowl. Stir until combined. Store in an airtight container or jar. To use, simply rub a small amount on clean lips. Use your finger to scrub it around for about a minute. Allow it to set for a few minutes longer, then wash it off (or lick it off, if you're feeling hungry! ).